Hello, I've recently moved from Lispool, and I've been looking for a job. I've seen some of your posters around, and heard a fair bit about your company, and I've got to be honest, you're my first, and only choice in employers I'd -like- to have. I'm applying specifically for a Sales Associate position, and while I don't have any of my medical records with me after the move, I'm more than happy to submit to a medical exam if it's more convenient than having such things delivered from Lordwain. Our company doctor sees all potential hires as part of the interview process. If you have any trouble locating Dr. Tael'naran, please let us know. When you are ready, contact us and we'll schedule an interview after your medical evaluation. I am in need of extra murai, and I noticed that this enterprise has been doing very well and am curious to see if maybe I could get a job or at least a part-time job. I am good at Baked Goods. As in I can bake things like cakes and cookies and pies and stuff. If I need to tell you anything else, I have no idea. So that's it for now. Thank you for your interest in joining Chimera Enterprises. You will have to take a medical evaluation with our company doctor prior to scheduling an interview. Dr. Tael'naran will be contacting you shortly. I worked briefly as an Intern and now I realize the field I was educated myself for (Arcane History) is not full of employment opportunities. If you have a job available I would love to work for you on a more permanent basis. Please see Doctor Tael'naran for your medical evaluation. I think we have just the job for you! We'll schedule an interview after your visit with the doctor to discuss it. Greetings. It has come to my attention recently that an open position has presented itself within the Human Resources department of your company. I hereby express interest in applying for such a position, and wish to schedule an interview and/or medical examination as soon as conveniently possible. Hello! I've had a medical evaluation done with Doctor Teal Norway and would like to schedule an interview as soon as possible. Thanks! Hello! Thank you for your interest in joining Chimera Enterprises. Please see Dr. Tael'naran for your medical evaluation, he'll be in touch with you shortly. Hello! 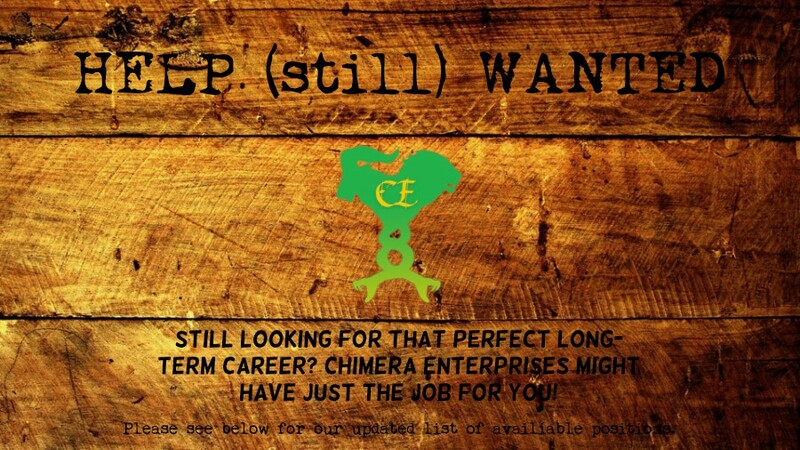 Thank you for your interest in joining Chimera Enterprises! Unfortunately, after doing a background check it seems you have an extensive criminal record. We're sorry, but we can't hire criminals! Intern: Any person willing to be taken in as an intern will serve as a sort of student to any department of his/her choosing. They will be tasked with the occasional odd job every so often to help out around the office, and have the great opportunity to become familiar with the trade of Chimera Enterprises along with being accepted into our loving community. Head of Catering: This position requires a true leader; one who is willing to lead and train his/her underlings while also helping to provide custom cuisines and sometimes bountiful amounts of food to our generous public. We are looking for at least two years of work experience, though this aspect is not required. Head of Janitorial Department: This position requires a truly hardy individual; a person who is willing to brave out even the toughest domestic, industrial, and sometimes chemical messes. Believe us, this position is not for the faint of heart. This individual would, furthermore, also be in charge of doing routine cleanings and safety performance checks of all of our unique equipment. Please contact us directly for further information. Manufacturing Assistant: This position will not differ much from the classic, run-of-the-mill intern (except that you get paid). They will assist in the production and distribution of our glorious line of products. Will require experience in numbers. Quartermaster: This position will be in charge of counting, logging, and moving the products that we produce. Essentially, they will make sure everything goes to the right place, at the right time. Test Subject: This position requires any soul willing to be subjected to the products that have passed screening. You will be required to fill out and sign a safety waver upon being hired. Head of Security: This position will be tasked with distributing security detail when we host our esteemed events, keeping track of security mishaps when they happen, and overall making the workplace a safer and friendlier environment for both our outgoing employees and our generous public. Security Guard: This position will require any man or woman who is thoroughly experienced in the art of retaining rowdy citizens. They will most likely be running security detail at most of our esteemed Chimera Enterprises public-oriented events, as well as occasionally around the office when required.